Coming to the awards, I received the Kreative Blogger Award ,one lovely blog award,I Love your blog award from Sukanya. 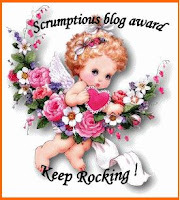 I also received scrumptious blog award from Shanti. Thank you so much for sharing these wonderful awards with me I truly appreciate this. Sounds of children playing outside. She is so talented, friendly and sweet. My hometown, where I grew up. Clothes that won’t fit well or suit well. Face Powder (I don’t use cosmetics or make up). Simplicity, Smile and Decent Hair style. I just mix and match . Tea is a must in the mornings and Coffee sometimes in the evening. Just take a stroll in the fresh air or talk with mom. I love my daughter the most. Reason(s) for you to blog? Thanks a lot dear for that sweet gesture, u have made my day. thanks a lot dear for passing those awards to me... Its very nice to know about you.. thnx again..
Congrats dear and nice to know more about u..
Hey Congrats on ur award! enjoyed reading yours. Congratulations on all your awards! You are one very interesting lady.